I joined another swap (the postage is killing me for all these swaps!) 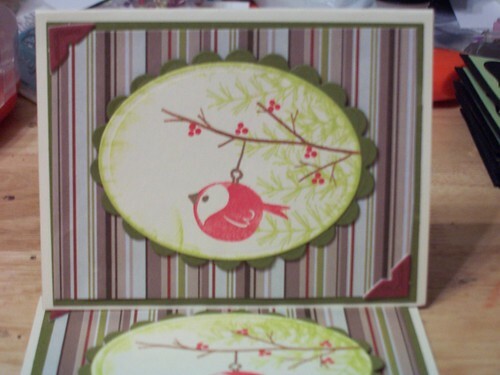 at Inspire Swap Chat for Christmas cards in June. 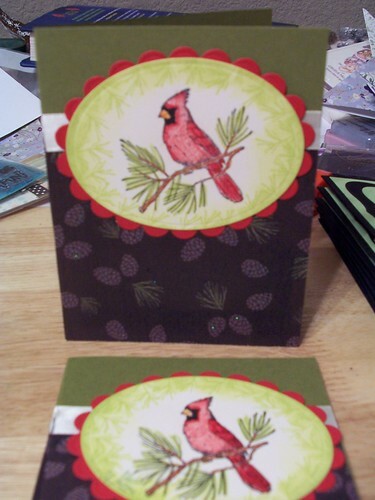 I use a lot of Christmas cards so this swap will probably actually get used by me. Of course when I receive those over the top awesome cards I can't bare to part with them. For those of you out there in blog land who are not familiar with how a swap works, here is a run down of the basics. 1. You go to a site that has swapping boards (I use Inspire Swap Chat, which is a group of ladies who swapped on the old Papercrafts Mag site before it was revamped) and sign up. 2. Hostesses post swaps with a theme, size, quantity requirement and due date. Find one you like and sign up. 3. Send your cards, enough postage to get them back, and an envelope to return them in to the hostess by the due date. 4. The hostess will swap out all the cards. You get back however many cards you sent in with in a couple of weeks. 5. Enjoy the creations you received back. 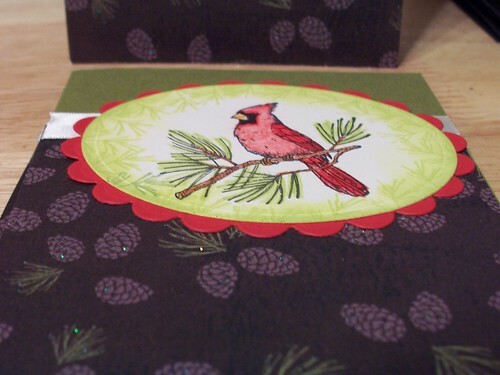 I often get new ideas or color combos from swap cards. Now on to my cards. This past holiday season I made the decision to work through the Halloween and Christmas papers in my stash before I bought any new stuff. However I ended up winning some blog candy that was the SEI Alpine Frost collection. I made a few cards with it last year. I pulled it out to use for these cards because I didn't get to use as much as I wanted last Christmas.